Published by George Baxter in 1852 (Baxter’s Number 101). 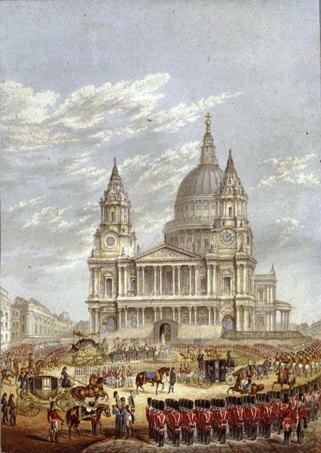 The cortege is seen drawing up to St. Paul’s Cathedral at nine minutes past 12 on November 18th, 1852. In the centre is the deceased Duke’s charger, presumably “Copenhagen,” with his master’s top boots reversed. The body of the Iron Duke had been removed from Chelsea Hospital to Horse Guards. The funeral procession was so large that it took an hour and a half from the procession starting before the Funeral Car itself was in motion. There were 15,000 persons in the Cathedral and millions lined the procession route. Baxter says he sketched the scene from No. 1 St. Paul’s. The print was produced from a plate and eight colour blocks, and was originally sold at 1s. 6d. The print was later included in Baxter's republication list. Baxter Process Print, size 6 1/8 x 4 3/8 ins. This print is unsigned. The same design can also to be found on a Prattware plate. George Baxter published a number of prints that captured significant events of his time.